Perion chose her topic after observing dementia firsthand as her grandmother passed away from it and her mother-in-law lives with the condition. 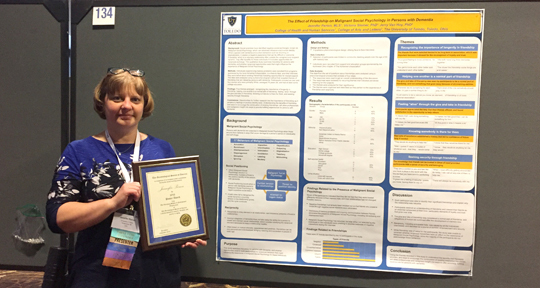 Jennifer Perion, a doctoral student in the Health Education Program, received one of five poster awards presented to Gerontological Society of America student members. She presented her research on “The Effect of Friendship on Malignant Social Psychology in Persons With Dementia” at the society’s annual scientific meeting. For her research, Perion worked with the local Alzheimer’s Association, where she conducted face-to-face interviews with 10 individuals with dementia. “I asked them about changes in their social relationships after memory loss. I then asked them about their friends and opportunities for reciprocal exchanges among their friendships,” Perion, a part-time instructor in the School of Population Health, said. These interviews revealed five themes related to dementia and friendship, Perion said: recognizing the importance of longevity in friendship; helping one another is a normal part of friendship; feeling “alive” through the give and take in friendship; knowing somebody is there for them; and seeking security through friendship. Only five poster awards were given out by the Emerging Scholar and Professional Organization to Gerontological Society of America student members who had an abstract accepted for presentation at the conference. The Gerontological Society of America is the nation’s oldest and largest interdisciplinary organization devoted to research, education and practice in the field of aging. This entry was posted on Thursday, March 16th, 2017 at 3:56 am and is filed under Health and Human Services, News, Research, UToday .